1) If you have entered all four Advent Calendar giveaways, go back and leave one comment on your favorite one telling me you've entered all four. 2) Go push that little FB "like" button on the bottom of ONE, TWO, THREE or ALL FOUR of the posts and leave an extra entry telling me that you did this on each post. I love the colors and designs of happythought. Everything is so fresh and bright. Here's a few of my favorite shop items. 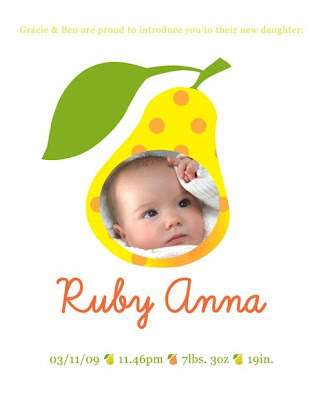 Custom Birth Announcements - ADORABLE! 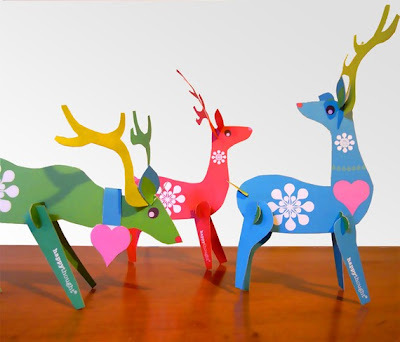 One winner will receive a Christmas Advent Calendar Garland (pdf pattern) from happythought. 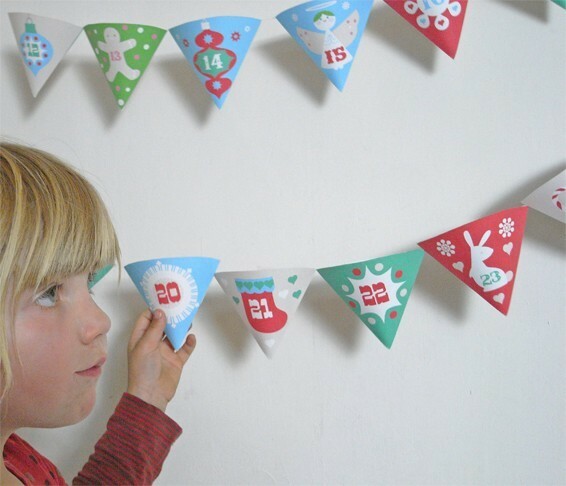 The printable pattern will make a garland of little funnel cups for you to hide treats in as you count down the days until Christmas. 2) Stop over at happythought and find an item you like. Then come back and tell me about it. 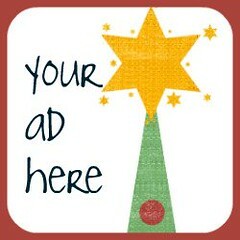 4) Leave a comment telling me when you put up your Christmas tree. 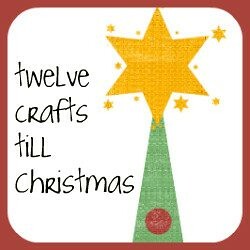 My favorite item is the Christmas Garland Retro printable. I "heart"ed the Christmas Garland Retro printable in the Etsy shop. I always put up my christmas tree the day after Thanksgiving. This has been a tradition my family has followed since I was born and this is a tradition I have continued with my own family. I try to get our tree up by Dec. 1st. This year, I accomplished my goal...and I still have 3 more days to spare! Woot! I love HappyThought's Retro Christmas Garland! 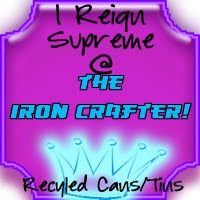 I am a 12 crafts follower! 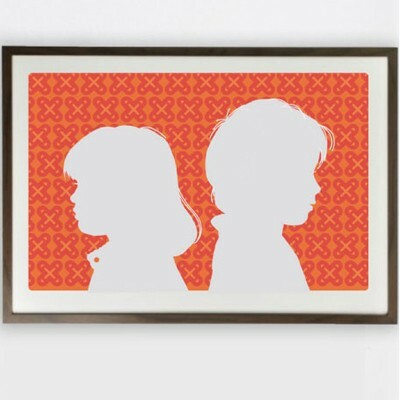 I like Happy Thought's children holding hands silhouette portrait. We got our Christmas tree today - it will be decorated by me and my preschooler over the next day or two. I really like the Silhouette portrait in orange. We put up our tree a couple of days after Thanksgiving. I've entered at least once for each giveaway! Thanks for the opportunity! My tree went up about a week before Thanksgiving. We travel a lot during the holidays so I like to put it up early so I can enjoy it longer! I like the Custom Silhouette family portrait print colorful. I need to go through my old photos to finds some of my girls. We do not have a traditional time to put up the tree. The rest of the decoration go up right after Thanksgiving. But the tree goes up when I have help. It also depends if we have a real one. Last year it was a week before Christmas. I am a 12 Crafts follower. I love the Custom Silhouette portrait with bird. I put my tree up on Black Friday. I would have on Thurdsday, but I was just too tired. I like the siloutte dogs, cute. we put the christmas tree on december first (here is an holliday, we celebrate a revolution on 1640, when we got separate of Spain) so, we can really enjoy with no pressure of time. Wow. What a great shop!!! I love the Lucha Libre print - my kids would love that! We put up one of our trees yesterday - we have the second still to do! I "liked" the post on Facebook! We put up our tree last saturday the 27th of November! getting our tree this coming saturday!! can't wait!